Samsung Electronics sent out press invitations Wednesday to showcase its new tablet Galaxy Tab S3 at the upcoming Mobile World Congress. 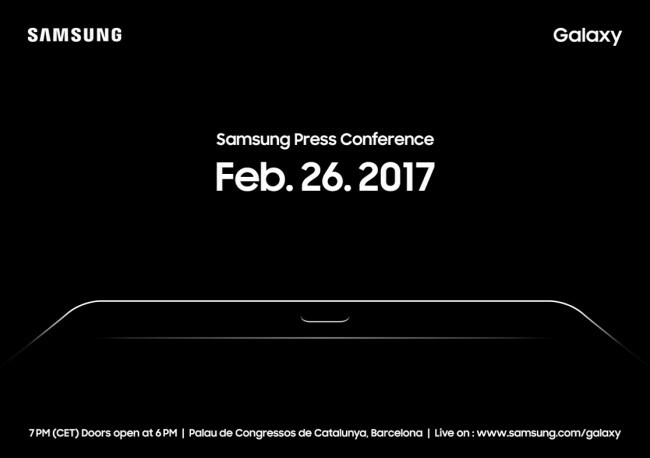 According to the invitation, Samsung said it would unveil its new product at the Samsung Press Conference to take place in Barcelona on Feb. 26, a day before the MWC’s opening ceremony. Although Samsung did not elaborate on details of its new product, the photo attached showed the bezel in the bottom of the tablet and the contour of the home button, indicating it is a Galaxy Tab S3, industry sources said. The Korean tech giant is also expected to give the audiences a glimpse of its flagship smartphone Galaxy S8 at the event through one-minute video clip. Samsung, which normally unveiled its Galaxy S series at the MWC, delayed the launch to April due to the safety issues caused by Note 7 explosions. Galaxy Tab S3 is a new model following predecessor Galaxy Tab S2, which was revealed in August 2015 in Korea. The new tablet features a 9.6-inch (24.4 centimeters) display panel, Qualcomm snapdragon 820 chipset, 12-megapixel rear camera and 5-megapixel front camera. The tablet comes in long-term evolution and Wi-Fi models, runs on Android 7.0 Nougat and is 5.6 millimeters thinner than the predecessor. Galaxy Tab S3 is expected to go on sale in March in Korea for around 700,000 won ($606).